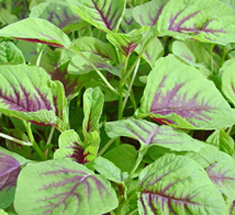 You are at:Home»Herbs»Amaranthus mangostanus Linn. Latin name : Amaranthus mangostanus Linn. Description : The leaves are high in vitamins A and C and are alterative, antibiotic, astringent, carminative, demulcent, diaphoretic, diuretic, nutritive, stimulant and tonic. The whole plant is useful in haemorrhages, haematuria, menorrhagia, nosebleed, diarrhoea, dysentery and gastroenteritis. Also useful in ulcers, tuberculosis, fever, insanity, gonorrhoea and piles. Recommended Dosage : 400 g to 800 mg powder of whole plant.